The Apple iPad is a gadget that appeals to a really wide audience. Take the example of my parents, who are retired and happy iPad users. In fact, both my parents are on their second iPads, and I'd venture to say they get used many times per day. I also know many young children who devour screen time with great gusto. Parents realize the iPad can keep a kid occupied (and quiet) for hours at a time. Apple seems to have settled on a size and design for the iPad that has stayed true for several years (as they have with the iPhone's design). They've also settled on a price ($329) for the entry-level iPad. So it came as no surprise Apple introduced its newest iPad a few weeks ago with the same form-factor and the same $329 entry price. But a new model means a few new features, so let's take a look at what's new. I've been testing the 2018 Apple iPad with Wi-Fi and Cellular with 128 gigabytes of storage, which costs $559. This year's iPad looks an awful lot like last year's iPad. It retains the same 2,048-by-1,536-pixel resolution 9.7-inch Retina display with the same bezels and the same Touch ID sensor in the home button. The physical dimensions are also the same (9.4 by 6.6 by 0.29 inches), and it weighs just over one pound. All cases and accessories for last year's iPad will fit. Apple has taken to just calling it iPad, with no other designator. It is available with 32 or 128 gigabytes of internal storage. It charges with the same lightning port as previous models. Set down, side by side, it looks identical to last year's model. This year's iPad has the same cameras—an 8-megapixel main camera with an f/2.4 lens and 1080p HD video recording. The front-facing camera has a 1.2 megapixel sensor with an f/2.2 lens and 720p HD video capture. Inside you'll find 802.11ac Wi-Fi, Bluetooth 4.2 and an optional 4G LTE cellular radio for use on GSM and CDMA networks. The 32.4-watt-hour lithium-polymer battery should last for up to 10 hours of use. I found that to be accurate. The 2018 iPad has the same button placement and the same pair of speakers on the bottom. It also still has a headphone jack. There isn't much new on the inside. The no-brainer update is to the processor. 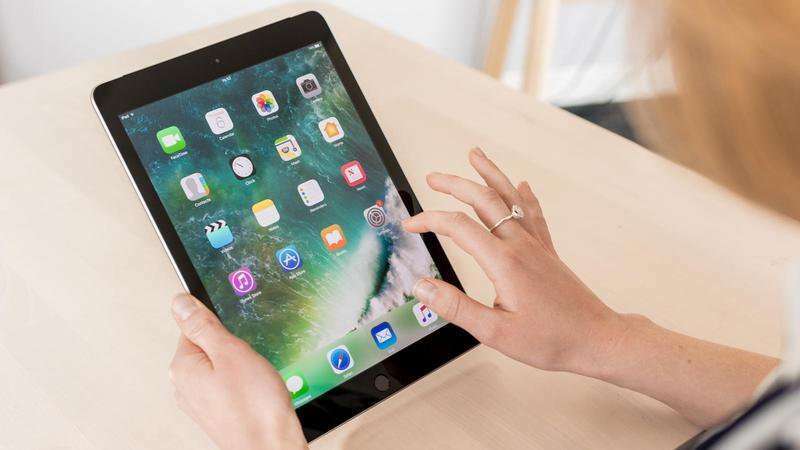 Every updated iPad model has had a faster processor than its predecessor, and the 2018 iPad is no exception. It comes with the A10 Fusion chip, which is the same one from the iPhone 7 and 7 Plus introduced in 2016. Last year's iPad had an A9 processor, which was also used in the iPhone 6S and 6S Plus. The biggest improvement is the ability to use Apple's Pencil. The 2018 iPad is the tablet almost everybody needs. Apple had kept the pencil for buyers of their high-end iPad Pro line, but this time they've brought pencil compatibility down to the masses. Using the pencil on the 2018 iPad is the same as using it on the iPad Pro. The pencil is pressure sensitive, and you can change the thickness of the drawing as you tilt the tip on the screen. The pencil remains expensive, as compared to the price of the iPad. The iPad introduction also brought an announcement of a cheaper ($50) stylus from Logitech called Crayon, but it doesn't have pressure sensitivity. Nice to see Apple letting others in on the stylus market. Of course, you could just use your finger. The pencil is not required. The 2018 iPad introduction was held at a Chicago high school, as this iPad is aimed squarely at the education market. Apple thinks schools are ready to buy lots of iPads and pencils for their students. Academic pricing starts at just $299 for the 2018 iPad and $89 for the Apple Pencil ($99 for the rest of us). There are still Windows laptops and Chromebooks that cost less than the iPad, so Apple is hoping educators and administrators take note. I frequently get asked to recommend tablets, and without fail, I point people to the iPad. These days there are only three iPad models to choose from—the 7.9-inch iPad mini, the 2018 iPad and the iPad Pros. Would be nice to see the bezels get smaller (think iPhone X), but I'm guessing Apple will save that design for the next iPad Pro. Speaking of the iPad Pro, now that the "regular iPad" can use the Apple Pencil, why would anyone want to spend $300 more for an iPad Pro? If you've ever wished your iPad was faster or had a bigger screen or you need to run two or three apps at the same time, then you should look at the iPad Pro. Designers and photographers are the target market for the iPad Pro. For everyone else, the 2018 iPad is the model I'd recommend for everyone who doesn't need to make their living with an iPad. If you have a 2017 iPad, I'd hold off on upgrading unless you really need to use the pencil. If you have an iPad Air 2 or older iPad and it's time for you to upgrade, you will be delighted with the new iPad. The new iPad is available in space gray, silver and gold in 32gb and 128gb for $329 and $429 for the Wi-Fi model. Add $130 for LTE. The Apple pencil is $99. Pros: Faster. Supports the Apple Pencil. Cons: Bezels give it a dated look. Speakers could be louder. Bottom line: The iPad for the masses is quite worthy of the title.